Cate: Please welcome Karen Michelle Nutt. Karen, will you please share a short bio with us? Karen: I live in California with my husband, three fascinating children, four dogs, three cats and a guinea pig. 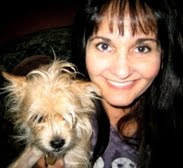 Jack, my Chihuahua/Yorkshire terrier is such a sweet pooch. He’s my writing buddy and sits long hours with me at the computer. Vampires, shape shifters and Fallen Angels embrace my darker side, where their worlds intertwine with ours. There is a legend passed on from generation to generation among the Fallen. If one of the brethrens finds their true soul mate, they’ll not suffer damnation, but shall find eternal happiness. They are known as the Warriors For the Light. The humans have a legend, too. A brush of an angel’s wing is a blessing, a binding of their love. Her life will be his and his will be hers, forevermore. Cate: Sounds incredible. Please tantalize us with a story blurb or excerpt. Karen: Eli is being tried by the Elders for breaking the rules and forming a relationship with a human. He didn’t go easily and is banged up a bit and his hands are bound. Chaz paced as he thought over what Lailah suggested. The elder never made rash judgments and wouldn’t be rushed now. The crowd surprisingly was quiet. It was as if all held their breath for the final say of his fate. Chaz finally stood still, his gaze pinning him down with a fierce look. He had the feeling the elder would much rather kill him than deal with what he felt would be a farce. Chaz glanced at his wife, his features softening for a moment. His eyelids closed, the thick lashes were surprisingly dark against his skin when his hair on his head was a light shade of bronzed gold. When he opened his eyes again, the decision was made. His gaze narrowed in on Eli once more. “So be it.” With a wave of his hand, magic poured from his fingertips and landed on him, bathing him with warmth. The binds around his wrists vanished. Bones knitted together, bruises faded, making him whole. 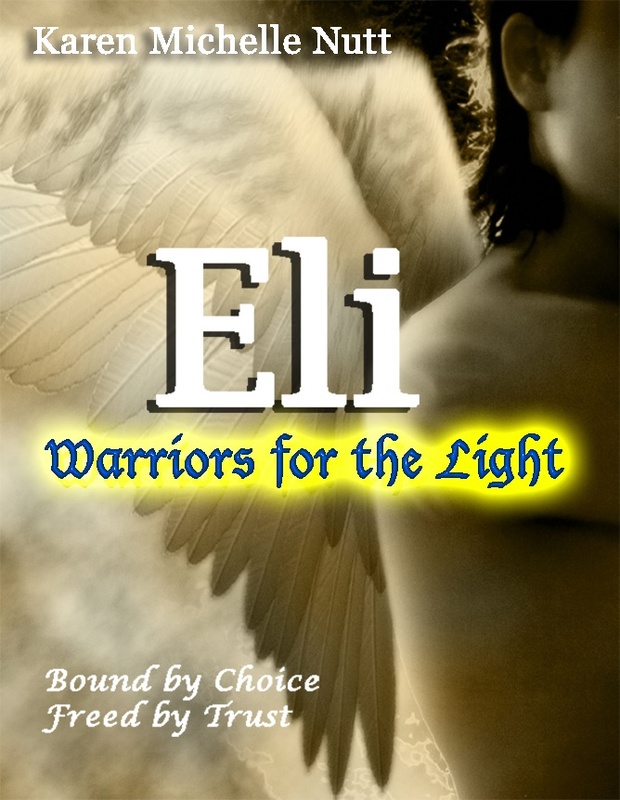 Eli stood and spread his dove colored wings wide, testing them. He looked at the elder with a raised brow, confused to why the elder healed him. “I thought you were going to take my wings.” He probably shouldn’t have pointed out that fact, but his tongue obviously didn’t know when to keep quiet. Eli swallowed the lump in the back of his throat and did as he was told. He dropped his T-shirt at his feet and stood straight, his gaze focused in front of him. Chaz circled around him, his fingers caressing his newly healed wings. “Are you sure?” He stood close and his words only reached his ears, giving him one last chance to change his mind. Chaz sighed and shook his head. “So be it then.” He stepped behind him and the ancient words left his lips to the rhythm of a Gregorian chant. Blinding pain exploded from Eli’s shoulder blades, sweeping down to his lower back and nausea rose in his throat, threatening to choke him. Staggering, he went down, falling to his knees with his hands on the floor bracing him. Oh God, he was going to die. His wings were melting into his skin and the burning flesh hit his nostrils with the sickening scent. He lifted his head to the heavens and let out a deep guttural cry for mercy. Cate: Wow, that was great. What inspired you to write about the theme? Karen: The Dead Sea Scrolls were the inspiration for The Warriors for the Light series. I was intrigued with The Book of Enoch. It’s about the Fallen Angels called the Grigori or Watchers. Of course all my tales are a figment of my imagination and I leaned toward a more romantic view for them. Karen: I like to have a background for my characters. For my fallen angels, they didn’t fall from heaven and lose their wings like some of the more traditional stories betray them. They are the Grigori/Watchers, the half-human, half-angel beings. In my stories the Watchers are shifters. They can walk among us in their human form, but have the capability to shift into their more angelic form with wings and all. Karen: I’m working on Lucca’s story for the Warriors for the Light Series. He’s the villain in Eli’s book so he has a lot to atone for in his tale. Short stories: Second Time Around Anthology: The Spirit of Love is my ghostly tale with a twist. The most rewarding is when a reader tells me how much they enjoyed one of my stories. Who are some of your favorite authors and books? What are you reading now? 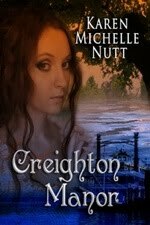 http://kmnbooks.blogspot.com or of course I’m on facebook (under Karen Michelle Nutt), myspace and Twitter (KMNBooks). Karen: What are your favorite paranormal tales you can’t get enough of? Do love Vamps? Werewolves? Shifters? Angels? Dragons? If you could become any paranormal being, which one would you choose and why? Cate: Readers, Karen is giving away a copy of Eli to a random commenter... so start commenting. Karen will draw the winner’s name, notify the winner and post the winner’s name here. Thanks for being my guest, Karen! Best of luck with all your projects. I love Castiel from Supernatural. He's one of my favorite characters.I'm so glad they signed him on for a regular on the show. I am slowly making the transition to the paranormals. For the longest time I wanted something I could relate to or at the very least explain. As time passes, I am enjoying the escape from "reality" and really enjoying them. I enjoyed reading your excerpt and it immediately drew me in. Good luck and happy writing! Thanks for the well wishes, too. Hi Karen, and Cate...oh, what a terrific post. "The brush of an angel's wing" just is the most evocative phrase I've read for a long time. Your concepts are just terrific, Karen. I love the idea of angels. Confess I was kinda a sucker for that show Touched-By eons ago. The Christmas specials with Randy Travis still live in my heart. I think the concept of time-travel is incredible. I used to discuss it with the physics teacher during lunch duty when I taught high school. That said LOL I thought Time Traveler's Wife was one of the most disappointing books ever. The movie, which I just managed to catch on cable the other night, actually was better than the book. Rarely happens. Well, I have babbled long enough. Thanks for the great post, ladies. I haven't seen the specials with Randy Travis. I'll have to see if I can catch one. The Time Travelers Wife had me intrigued, but sad, too. I knew it couldn't end with a happy note and I'm a sucker for happy endings. Thanks again for coming by and saying hi. Loved Eli's story. Will we get to read Gideon's story in the future? Great interview! Cate you always ask the very best questions! Karen, you know I'm a huge fan of yours and the Warriors for the Light series is no exception. I love this excerpt. SO REAL!!! I would love to win a copy, and I'm so glad to see more of your wonderful imagination brought to life! Time travel intrigues me, too, and angels and demons are my faves wien it comes to paranormal reading/writing. You bet there's a story for the red-headed fallen angel.Lucca's story is in the works now. Gideon's tale is scheduled to be third. Stay tuned! So glad you came by. I'm a fan of your writing, too. I just read your wounded hero story in the "A Summer Collection" anthology. Like always, you've written memorable characters. Of course you're entered in the contest. My daughter picks the names out of a bowl (sorry don't have a hat.) lol This way everyone has a fair chance. Thanks again for stopping in. I look forward to reading more of your wonderful stories, too. Karen Michelle, I HAVE to have ELI. These books sound fabulous, as do your others. You have a wonderful imagination. Karen, wonderful interview. Gotta love all those paranormal heroines and heroes. Losing wings. Yep, that is a tough way to go. Ooooo-eeee ouch! Thank you for coming by to say hi. The Fallen thought to have no souls. Eli discovers maybe the Elders were wrong. He's willing to risk it all to find out. Thank you so much for coming by and taking a sneak peek. Sorry to be so late in commenting. One of those crazy days! But I, too, love stories about angels. I can't wait to read Eli either. Great interview. I am not really into paranormal, but your stories sound fascinating Karen. Thank you. I'm glad Eli sparked some interest. A great interview and a powerful excerpt. I loved Eli and I can't wait for Lucca. (Don't enter me in the drawing as I already have Eli.) Just came by to say HI! Hi, Cate and Karen! 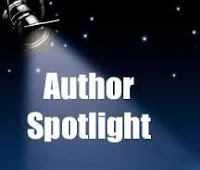 I enjoyed your interview--it's always a treat to have the chance to see what a writer's life is like ;) You're such a juggler of many things and talents! I'm intrigued by the snippet and descriptions you posted--will definitely be checking out your titles! Thanks! Karen. It's always a pleasure to learn more about your work and Cate, You have an amazing site. Thanks so much for popping in to say hello! I want to thank everyone for coming by and chatting with me. Thank you, Cate for letting me share my stories. You have a lovely site. Now for what everyone has been waiting for. The winner is...Cheryl. THANK YOU KAREN!!!! I am thrilled! !